I’m the first one to admit that I arrived late to the Sherlock party. I didn’t start watching this BBC show until a few months ago, but once I pressed play on episode one, I couldn’t stop! I love that the show is a modern adaptation of a Victorian classic, and I really love all of the subtle Victorian elements throughout the show. The creators, Steven Moffat and Mark Gatiss, are both huge fans of Arthur Conan Doyle, so everything in the series is really well thought out. Tonight the special Victorian-era episode airs on PBS at 9pm, so in honor of “The Abominable Bride,” here are three books to buy for all the Sherlock fans in your life. Obviously the most important books for Sherlock fans are the original Sherlock Holmes stories. But in case you don’t have time (or have no desire) to read through all of those stories, here’s a great option. This first book is a selection of Sherlock Holmes stories that have been specially chosen by Mark Gatiss and Steven Moffat. Each story has an introduction written by the creators of the TV show. I think this book would give you a good look at which stories they find most compelling–maybe there would be some hints for future episodes? Who didn’t love all of those DK Encyclopedia books as a kid? This is a big book of Sherlock Holmes and Arthur Conan Doyle trivia. It explains the major characters, puts the stories in context, and shows how Sherlock solves crimes through deductive reasoning. Coloring books are huge right now, and while they typically feature geometric or floral patterns, you can also find nerdier options–from this Harry Potter one to Doctor Who, Game of Thrones, and everything in between. 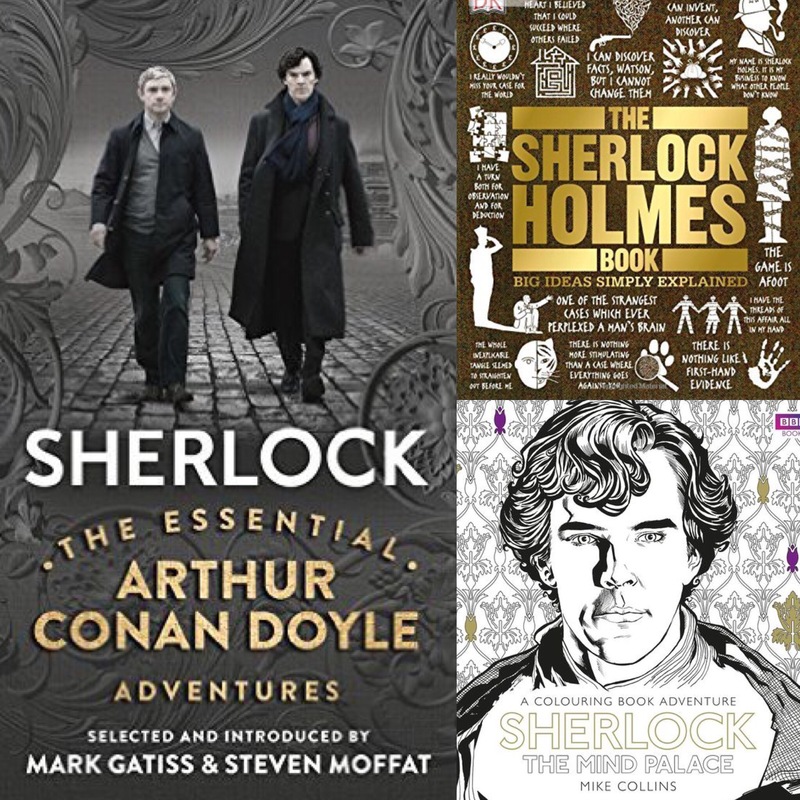 I also really love that one of the titles of this book is “A Colouring Book Adventure.” That way when you’re watching Sherlock and Watson go on actual adventures, you can be safe at home, coloring.